Jacobs’s ideas came from the heart. Her foray into urban theory was partly inspired by the failed urban renewal efforts of the post-World War II era that displaced tens of thousands of poor and minority residents and resulted in the isolation or destruction of previously vibrant neighborhoods in New York, Chicago, Pittsburgh and elsewhere. Fundamentally, there is little difference behind the social engineering mentality of those who wrought the disaster of postwar urban renewal and the mindset of today’s planners trying to regulate away suburbia in hopes of master-planned urban living for everyone. More and more, these planners are calling for the centralization of land-use control under state and regional governments, usurping the American tradition of local control over development. In the view of many planners, this command-and-control bureaucracy is needed because municipal planning is too "uncoordinated" to achieve "societally beneficial" goals like open-space preservation, mass transit and urban densification. But if they go back and reread "Death and Life," they’ll find Jacobs rightly asking, "How is bigger administration, with labyrinths nobody can comprehend or navigate, an improvement over crazy-quilt township and suburban governments?" She went on to ridicule the idea of regionalism as "escapism from intellectual helplessness" predicated on the delusion that the problems planners are unable to solve at the local level will somehow be more easily addressed on a larger-scale, concluding that "no other expertise can substitute for locality knowledge in planning." Politicians and planners would do well to commemorate Jacobs by revisiting her work. Despite the best efforts of well-intentioned planners, you can’t "create" a vibrant city or neighborhood. The best cities and neighborhoods just happen, and the best thing we can do is to step out of the way of innovators and entrepreneurs. LEONARD GILROY. "Urban Planners Are Blind To What Jane Jacobs Really Saw." The Wall Street Journal (Tues., May 2, 2006): D8. 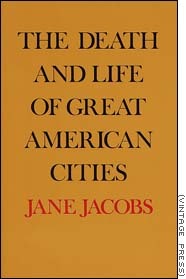 To employ as a rhetorical platform the death of Jane Jacobs (“What Jane Jacobs Really Saw,” Leonard Gilroy, May 2) to assault all of modern day urban planning, and the planning here in Portland Oregon in particular, is both disingenuous and erroneous. How do I know this? As a student of architecture and urban design, through 15 years as an urban planner in Portland, and through specific conversations with Jane when she visited Portland less than two years before her departure. Jane Jacobs visited Portland more than once. In her most recent visit, she was asked repeatedly what she thought we might do differently or better. As sharp-tongued and stunningly articulate as ever, she consistently refused to take the bait. She found Portland’s planning results to be successful and replicable. Jeff Joslin, an architect, urban designer and planner, has been managing urban design and planning functions for the City of Portland for over a decade. He’s currently Land Use Manager, administering urban design, design review, and historic landmarks programs for the City.